Microsoft cofounder and chief executive officer Bill Gates has become the wealthiest man in America and one of the most influential personalities in the ever-evolving computer industry. 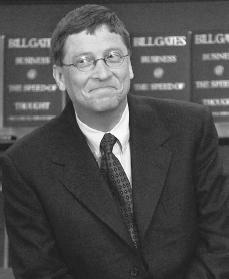 William H. Gates III was born on October 28, 1955, in Seattle, Washington. He was the second child and only son of William Henry Gates Jr., a successful Seattle attorney, and Mary Maxwell, a former schoolteacher. Kristi, his older sister, later became his tax accountant and Libby, his younger sister, lives in Seattle raising her two children. Gates enjoyed a normal, active childhood and participated in sports, joined the Cub Scouts, and spent summers with his family in Bremerton, Washington. Although Gates's parents had a law career in mind for their son, he developed an early interest in computer science and began studying computers in the seventh grade at Seattle's Lakeside School. Lakeside was a private school chosen by Gates's parents in the hopes that it would be more challenging for their son's intellectual drive and curiosity. At Lakeside, Gates came to know Paul Allen, a classmate with similar interests in technology who would eventually become his business partner. Immediately, Gates and Allen realized the potential of the young computer industry. Gates's early experiences with computers included debugging (eliminating errors from) programs for the Computer Center Corporation's PDP-10, helping to computerize electric power grids for the Bonneville Power Administration, and founding with Allen a firm called Traf-O-Data while still in high school. Their small company earned them twenty thousand dollars in fees for analyzing local traffic patterns. While working with the Computer Center's PDP-10, Gates was responsible for what was probably the first computer virus, a program that copies itself into other programs and ruins data. Discovering that the machine was connected to a national network of computers called Cybernet, Gates invaded the network and installed a program on the main computer that sent itself to the rest of the network's computers, making it crash (became damaged). When Gates was found out, he was severely punished, and he kept away from computers for his entire junior year at Lakeside. Without the lure of computers, Gates made plans for college and law school in 1970. But by 1971 he was back helping Allen write a class scheduling program for their school's computer. Gates entered Harvard University in 1973 and pursued his studies for the next year and a half. His life changed in January of 1975, however, when Popular Mechanics carried a cover story on a $350 microcomputer, the Altair, made by a firm called MITS in New Mexico. When Allen excitedly showed him the story, Gates knew where he wanted to be: at the forefront of computer software (a program of instructions for a computer) design. Gates dropped out of Harvard in 1975, ending his academic life and beginning his career as a software designer. At this time, Gates and Allen cofounded Microsoft. They wrote programs for the early Apple and Commodore machines. One of Gates's most significant opportunities arrived in 1980, when IBM approached him to help with their personal computer project, code name Project Chess. Gates developed the Microsoft Disk Operating System, or MS-DOS. (An operating system is a type of software that controls the way a computer runs.) Not only did he sell IBM on the new operating system, but he also convinced the computer giant to allow others to write software for the machine. The result was the rapid growth of licenses for MS-DOS, as software developers quickly moved to become compatible with (able to work with) IBM. By the early 1990s Microsoft had sold more than one hundred million copies of MS-DOS, making the operating system the all-time leader in software sales. For his achievements in science and technology, Gates received the Howard Vollum Award in 1984 from Reed College in Portland, Oregon. Gates's competitive drive and fierce desire to win has made him a powerful force in business, but it has also consumed much of his personal life. In the six years between 1978 and 1984, he took a total of only two weeks vacation. But on New Year's Day 1994 Gates married Melinda French, a Microsoft manager, on the Hawaiian island of Lanai. The ceremony was held on the island's Challenge golf course, and Gates kept it private by buying out the unused rooms at the local hotel and by hiring all of the helicopters in the area to keep photographers from using them. His fortune at the time of his marriage was estimated at close to seven billion dollars. By 1997 his worth was estimated at approximately $37 billion, earning him the title of "richest man in America." Many criticize Gates not just for his success, but because they feel he tries to unfairly—and maybe even illegally—dominate the market. As a result of Microsoft's market control, the U.S. Department of Justice brought an antitrust lawsuit (a lawsuit that is the result of a company being accused of using unfair business practices) against the company in 1998, saying the company had an illegal stronghold on the software industry. Gates maintained Microsoft's success over rivals such as Oracle and IBM was simply the result of smart, strategic decision making. U.S. District Judge Thomas P. Jackson did not agree, and in November 1999, he found Microsoft to be a monopoly (a company with exclusive control) that used its market power to harm competing companies. Because of the ruling, Gates faced the prospect of breaking up Microsoft. On January 13, 2000, Gates handed off day-to-day management of Microsoft to friend and right-hand man Steve Ballmer, adding chief executive officer to his existing title of president. Gates held on to his position as chairman in the reshuffle, and added the title of chief software architect. In the spring of 2002 Gates himself was scheduled to testify on behalf of Microsoft. The final ruling on the fate of Microsoft has the potential to be a landmark decision on the future of the computer industry. Aside from being the most famous businessman of the late 1990s, Gates also has distinguished himself as a philanthropist (someone working for charity). He and wife Melinda established the Bill & Melinda Gates Foundation, which focuses on helping to improve health care and education for children around the world. The foundation has donated $4 billion since its start in 1996. Recent pledges include $1 billion over twenty years to fund college scholarships for about one thousand minority students; $750 million over five years to help launch the Global Fund for Children's Vaccines; $50 million to help the World Health Organization's efforts to eradicate polio, a crippling disease that usually attacks children; and $3 million to help prevent the spread of acquired immune deficiency syndrome (AIDS; an incurable disease that destroys the body's immune system) among young people in South Africa. In November 1998 Gates and his wife also gave the largest single gift to a U.S. public library, when they donated $20 million to the Seattle Public Library. Another of Gates's charitable donations was $20 million given to the Massachusetts Institute of Technology to build a new home for its Laboratory for Computer Science. In July 2000 the foundation gave John Hopkins University a five-year, $20 million grant to study whether or not inexpensive vitamin and mineral pills can help save lives in poor countries. On November 13, 2000, Harvard University's School of Public Health announced it had received $25 million from the foundation to study AIDS prevention in Nigeria. The grant was the largest single private grant in the school's history. It was announced on February 1, 2001, that the foundation would donate $20 million to speed up the global eradication (to completely erase) of the disease commonly known as elephantiasis, a disease that causes disfigurement. In 2002 Gates, along with rock singer Bono, announced plans for DATA Agenda, a $24 billion fund (partially supported by the Bill and Melinda Gates Foundation) that seeks to improve health care in Africa. Although many describe Gates as cold and distant, his friends find him friendlier since his marriage and since the birth of his daughter, Jennifer, in April 1996. Further, he recognizes his overall contribution to both the world of technology and his efforts in philanthropy. In Forbes magazine's 2002 list of the two hundred richest people in the world, Gates was number one for the eighth straight year, coming in with a net worth of $52.8 billion. Gates, Bill, with Nathan Myhevrold and Peter Rinearson. The Road Ahead. New York: Viking Press, 1995. Ichbiah, Daniel, and Susan L. Knepper. The Making of Microsoft. Rocklin, CA: Prima, 1991. Wallace, James. Hard Drive: Bill Gates and the Making of the Microsoft Empire. New York: Wiley, 1992.
i would like your permission to use some of your artical for a project I am doing on the most famous people and their parents. More about their parents ideas on raising children. Bill Gates is a brilliant,Famous and Humblehearth person. this is such an inspiring article for the youngsters who are eagerly waiting for achievement. Thanks for publishing it. And i suggest youngsters to read this. This is very awesome. Very nice to read. bill gates is a brilliant. grate attitude and grate article. .